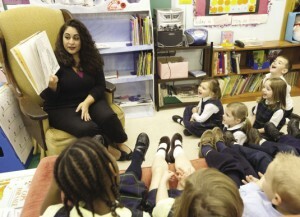 Kindergarten teacher Elizabeth Baird reads to her students during the full-day class at Blessed Sacrament School in Syracuse. Thank you for the world so sweet. Thank you for the food we eat. Thank you for the birds that sing. Thank you, God, for everything. Baird began teaching at Blessed Sacrament 14 years ago. In fact, her first Kindergarten class just headed off to college this fall. Her years at the school started much earlier, however, as she herself was a student there, as were her brothers and sister. Now it is Baird’s turn to have a profound effect on her students. With snack over, she calls some children into a small group in the “reading center,” while others finish a project at their desks before going to the “red carpet” to work on alphabet puzzles. Like any good teacher, she does seem to have eyes in the back of her head and cautions one child who may have rushed through her assignment to “make sure that’s your very best work.” The student reconsiders and heads back to her desk. Several times during the reading lesson, she reminds her students to “look her in the eyes” when their attention wanders, and she entices them with the possibility of singing their favorite “Alphabet Song” when the instruction ends. Baird knows each lesson takes time, and she is glad that Blessed Sacrament, like the other diocesan elementary schools, offers a full-day Kindergarten program.